JDBC – Java, SQL and jOOQ. Pretty neat! This query can simply be run like any other query in JDBC, and you don’t have to go through any hassles. + "  v_j t_j := ? ; "
+ "  FORALL j IN 1 .. v_j.COUNT "
+ "    INSERT INTO x (j) VALUES (v_j(j)) "
+ "    RETURNING i, j, k "
+ "    BULK COLLECT INTO ?, ?, ? ; "
+ "  i INT GENERATED ALWAYS AS IDENTITY PRIMARY KEY,"
+ "  k DATE DEFAULT SYSDATE"
+ "  num integer := 1000;"
How to do the same with jOOQ? How I Incorrectly Fetched JDBC ResultSets. Again. All the other types some sort of utilities. Unless you want to write generic JDBC code, because you don’t know what the SQL string is. It could be a SELECT statement. It could be and UPDATE. It could be DDL. It could be a statement batch (several statements). It could call triggers and stored procedures, which again produce nice things like warnings, exceptions, update counts, and additional result sets. You know, the sort of thing that might come flying in to a generic utility method like jOOQ’s ResultQuery.fetchMany(). "\n raiserror('e0', 0, 2, 3);"
+ "\n create table t(i int);"
+ "\n raiserror('e1', 5, 2, 3);"
+ "\n insert into t values (1);"
+ "\n raiserror('e2', 10, 2, 3);"
+ "\n insert into t values (2);"
+ "\n raiserror('e3', 15, 2, 3);"
+ "\n select * from t;"
+ "\n drop table t;"
Yeah. What’ll happen if we do this? e3? What on earth? So what happened with my statement batch? Did it execute? Only until the middle? Or did I get to the end as well? OK, quite obviously, we have to do this more carefully. We cannot use Statement.executeQuery() here, because we don’t know whether we’ll get a result set. In fact, we got an exception, but not the first one. Nope, the entire batch got executed. (Could’ve just removed the DROP TABLE statement and checked the contents of table T in SQL Server Management Studio, of course). Huh, quite a different result, depending on what method we’re calling. Does that scare you? Does your ORM get this right? (jOOQ didn’t but this is now fixed). Interesting. -1. I guess we can be very happy that at least it’s not returning null or a punch in your face. Crap. But did it execute completely? Yes it did, but we didn’t get that sweet result set after e3, because of that exception. But at least, we now got 3 update counts. But wait a second, why didn’t we get e0, e1, and e2? AHA, they’re warnings, not exceptions. 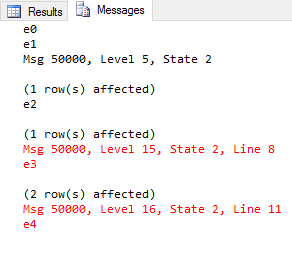 Funky SQL Server decided that everything below some severity level is a warning. Whatever. Anyway, let’s fetch those warnings as well! And while we’re at it, let’s use ResultSetMetaData to read the unknown result set type. Oh, tons of things, but I need material for future blog posts, too, right? Earlier this week, I’ve blogged about how to execute SQL batches with JDBC and jOOQ. This was useful for the MySQL, SQL Server, and Sybase users among you. Today, we’ll discuss a slightly more difficult task, how to fetch Oracle 12c implicit cursors – which are essentially the same thing. The anonymous PL/SQL block contains two cursors that are opened and returned to whoever calls this block using DBMS_SQL.RETURN_RESULT. This is kind of magic, as we’re calling a procedure, passing a cursor to it, and somehow, this has a side effect on the client of this program after the program ends. The above call might just as well yield some implicit cursors. You can’t know for sure. Unfortunately, that won’t work on Oracle as Oracle’s JDBC driver doesn’t implement the JDBC spec correctly. I’ve documented this flaw in length on this Stack Overflow question here. In case we’re using PreparedStatement, the original call to PreparedStatement.execute() will yield false (!) and the Statement.getUpdateCount() value is -1, which would normally mean that we should stop. Not in this case. Let’s just try one more time to get a result set, and tah-dah, here are our implicit result sets. Note that the algorithm now works with both static Statement and PreparedStatement, which (very unfortunately) behave differently when calling execute(). + "\n  OPEN c1 FOR SELECT 1 AS a FROM dual;"
+ "\n  OPEN c2 FOR SELECT 2 AS a FROM dual;"
How to get those cursors with jOOQ? Unfortunately, the term “batch” has several meanings, and in this case, I don’t mean the JDBC Statement.addBatch() method, which is actually a bit clumsy as it doesn’t allow for fetching mixed update counts and result sets. "\n  -- Statement #1                              "
+ "\n  DECLARE @table AS TABLE (id INT);            "
+ "\n  -- Statement #2                              "
+ "\n  SELECT * FROM @table;                        "
+ "\n  -- Statement #3                              "
+ "\n  INSERT INTO @table VALUES (1),(2),(3);       "
+ "\n  -- Statement #4                              "
The above API usage is a somewhat “hidden” – or at least not every day usage of the JDBC API. Mostly, you’ll be using Statement.executeQuery() when you’re expecting a ResultSet, or Statement.executeUpdate() otherwise. Statement.execute(): This method should be used if we don’t know the result type. The method returns a boolean, which is true when the first statement in the batch produced a ResultSet and false otherwise. Statement.getMoreResults(): This method returns the same kind of boolean value as the previous Statement.execute() method, but it does so for the next statement in the batch (i.e. for every statement except the first). If the current result is a ResultSet (the boolean was true), then we’ll obtain that ResultSet through Statement.getResultSet() (we can obviously no longer call the usual Statement.executeQuery() to obtain the ResultSet). If the current result is not a ResultSet (the boolean was true), then we’ll check the update count value through Statement.getUpdateCount(). If the update count is -1, then we’ve reached the end of the batch. What a nice state machine! The nice thing about this is that a batch may be completely nondeterministic. E.g. there may be triggers, T-SQL blocks (e.g. an IF statement), stored procedures, and many other things that contribute result sets and/or update counts. In some cases, we simply don’t know what we’ll get. It’s great that the JDBC API designers have thought of this exotic API usage on a rather low level. This makes JDBC extremely powerful. But who remembers the exact algorithm all the time? After all, the above minimalistic version required around 20 lines of code for something as simple as that. The DSLContext.fetchMany() method is intended for use when users know there will be many result sets and/or update counts. Unlike JDBC which reuses ordinary JDBC API, jOOQ has a different API here to clearly distinguish between behaviours. The method then eagerly fetches all the results and update counts in one go (lazy fetching is on the roadmap with issue #4503). The resulting type is org.jooq.Results, a type that extends List<Result>, which allows for iterating over the results only, for convenience. If a mix of results or update counts need to be consumed, the Results.resultsOrRows() method can be used. Note that if your batch raises errors, then the above JDBC algorithm is incomplete. Read more about this in this follow-up post.